Silver Run Falls is a 20 foot waterfall a few miles from the town of Cashiers, North Carolina. It is popular with locals and tourists alike. The falls are located after a flat, 200 yard trail. Additionally, there is a second secret falls located above Silver Run. On the left side of the cliff face of the falls, just inside the woods, there is a slope of granite with many roots for handholds leading to the top of the falls. Follow the trail up top until you hear the second falls on your right. 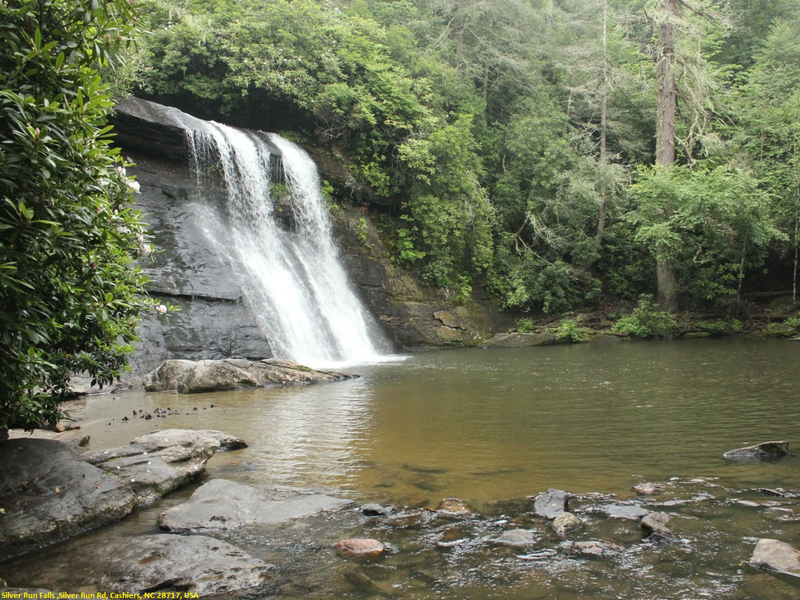 To get to this falls, head west on Hwy 64 from Lake Toxaway into Cashiers and take a left on Hwy 107. Parking is a little over 4 miles down on the left and is just a wide area on the shoulder with room enough for maybe 5 vehicles or so. The trail head is obvious - the trail is less than 1/4 mile and easy. On the way to the waterfall you'll cross the Whitewater River. It's not very wide at this point. Crossing used to be on a log, but a bridge has recently been built for safety reasons. There's a nice swimming hole at the base of the falls and the area is usually crowded on a warm day.